The 2.50-carat engagement ring is getting increasingly popular. Discover everything that you need to know about the rings within this bracket. Learn shopping tips and more. 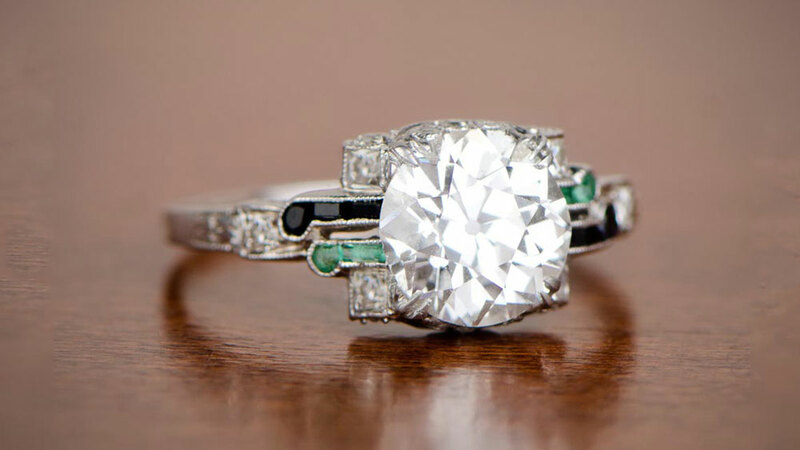 Why Choose a 2.50 Carat Engagement Ring? Once we get above 2 carats in diamond engagement rings, prices start to escalate pretty quickly. The main reason is the rarity of good quality examples above this size. This means demand is usually way ahead of supply. As a result, dealers can easily push the prices of larger diamonds more than they can smaller stones. All this can, of course, make buying 2.50 carat loose diamonds or engagement rings very expensive. The upside, of course, is that a diamond above that size looks just spectacular in almost any setting. At 2.50ct, the appearance of a well-cut diamond is incredibly impressive. And if you play a little savvy, you might be surprised at what you can get for your money. Here is a selection of some of the rings from the Estate Diamond Jewelry Collection in the 2.50-carat range. As we mentioned above, the price of any diamond, assuming it is of good quality, rises sharply above 2 carats. If we were to apply prices on a visual scale according to the price, it would rise steadily but consistently up to somewhere between 2 and 2.50 carats. At that point, it takes a very steep upward path until it is only a few degrees off vertical once you get past 5 carats. And so, based on that, you’d be mad to consider a ring with a diamond above 2 carats, right? Well, no, that’s not the case, actually. You need to consider what you’ll be getting for your money. You’ll be getting a diamond which is actually quite rare. If you buy an engagement ring, you’ll be getting a ring which has a presence that smaller diamonds just can’t match. Diamonds under 2 carats are beautiful, no argument there. But diamonds do have something of the “bigger is better” about them. This is certainly true at the 2.50-carat size. Actually, you won’t beat the market. Dealers in precious stones know more about their wares than you ever could, and pricing mistakes just don’t happen. But, there are strategies which mean you can get a lot more for your money than you might realize. If we take a look at some prices for 2.50-carat diamonds, you will see what we mean. As you see, by making small – and they are actually very small – compromises, we can save nearly 2/3 of the cost. Unless you are an expert, you will likely not to be able to tell the difference between the first in the above list and the last. I color is still considered colorless by GIA, the foremost diamond grading service in the world. A VVS2 (Very Very Slightly Included, standard 2) clarity diamond will also be eye clean. Diamond grading is done at 10x magnification. People viewing your engagement ring are unlikely to be carrying a jeweler’s loupe around with them. To even the keenest eye, flawless graded diamonds are indistinguishable from VVS2 diamonds. In case you’re wondering about whether the cut standard makes a difference, it does. However, with larger diamonds, extreme care is taken to produce the best cut possible. This means that few diamonds have less than ideal cut proportions. There are some, though, so don’t rule it out. 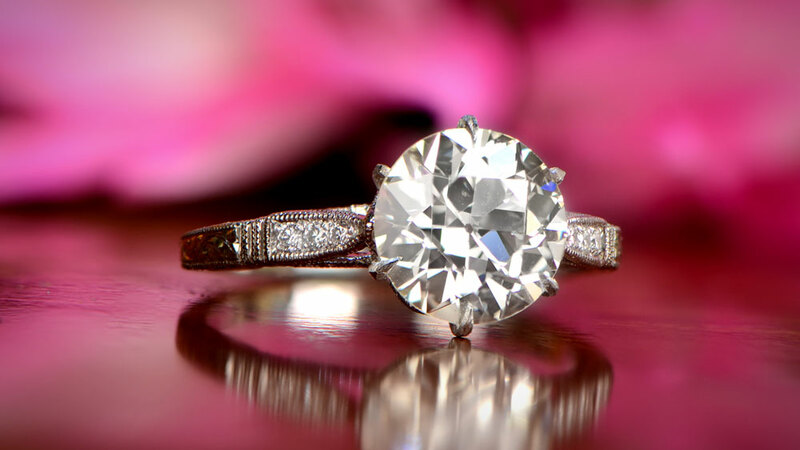 Genuine antique diamonds will usually have lower cut gradings. Color and clarity can make a huge difference, as we’ve seen, with very little visible impact. Another factor, and it may seem obvious to say this, is weight. Smaller diamonds are priced in steps of 0.1-carat or maybe even less. Larger diamonds are often priced in 1/4 or half carat steps. What this means, is that a 2.50-carat diamond may well cost the same as one at 2.90 carats. Similarly, a 2.40-carat diamond may cost the same as one at 2 carats. Online dealers are moving away from this practice and moving towards a more precise pricing scale. Traditional dealers, though, often still use the round up/down method to price their stock. You may also get a break if you have the ring made by the same people from whom you buy the diamond. It might not be much, in pure dollar terms, but you might get a solid warranty or free cleaning for life. It’s always worth asking. Also, consider antique diamonds. Although not cut to the same exact standards as modern diamonds, due to less precise techniques, antique diamonds offer exceptional value. Most antique diamonds are not available loose but as part of an engagement ring. The lack of formal grading standards for antique diamonds can often mean great deals on some stunning diamonds. How Will a 2.50 Carat Diamond Ring Look On My finger? Everybody’s hand is different. The size and shape of your hand are probably very different to the person next to you. Even the distances between your knuckles will be different. This makes it difficult to offer a firm view on what it will look like. The cut and size of a diamond also influence the design and size of the ring itself. 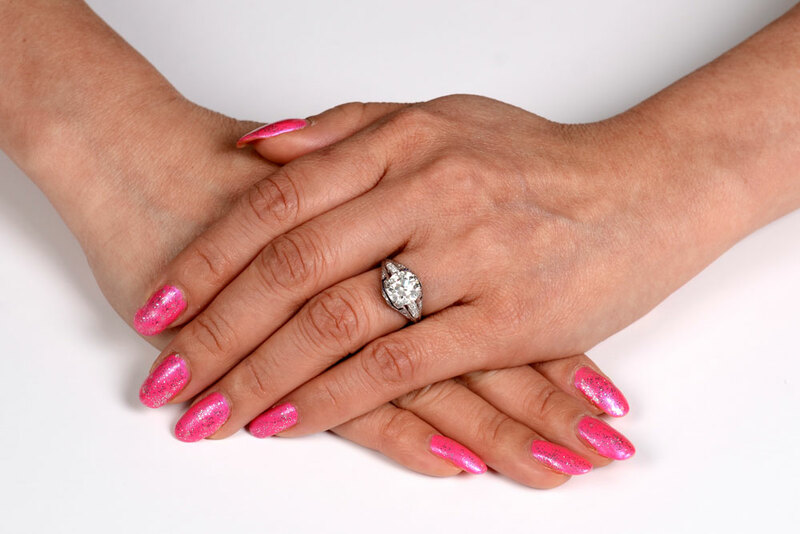 Some cut shapes can help make shorter fingers look longer, or can make the fingers appear slimmer. Conversely, some will have the opposite effect. We do recommend trying on rings with various diamond cuts before choosing your finished design. However, you can see some images below of 2.50ct diamond rings in various styles. These images should be used for a broad guidance only.